At the end of May I made the headlines of the local newspapers, though not for the reasons for which I had hoped – testing my secondhand knowledge that a car could run over your foot and not break it. It was probably made more newsworthy (within a news dessert) by the fact I broke the wing mirror with my lower ribs, accelerating the Toreador spin manoevre I successfully pulled off and causing me to become intimately and rapidly aquainted with the tarmac, which I duly blessed for breaking my fall with a generous dousing of spare haemaglobin. 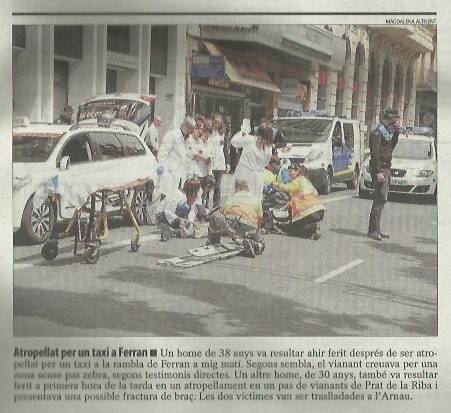 Cutting from the local newspaper, Segre, following the accident. This is one of the reasons it’s been so long since my last blog post, as I took the accident as a message for me to take some time to review, refresh and reinvigorate my life. The other reasons are what lead to the message being sent in the first place…Ok, so I also had a bit of a headache and sitting at the computer with my foot raised was not the best position to create. Anyway, I am now back to my projects, which include finishing the book I started at the end of last year, creating a new Leadership and Music website (15 pages/12 thousand words and counting) and developing new courses, following my Conscious Learning course earlier in the year. You see I’ve finally found a way of building my passion for music, an ever-present part of me, into my professional life by drawing on my lifetime of experience in music, primarily through the lessons it offers in leadership and teambuilding. This is a relatively unexplored, but huge and fascinating in its potential to effect positive change, which links it back to my life purpose of making a difference by helping people help themselves (and so others). Probably the most important (non-human) thing that helped me maintain this positive attitude is music and its effect on my emotions. Even at its most intense, music can have a long-term calming effect. You may feel very emotional, excited, sad or dreamy, but just by listening to music, your brain can function better and if you are focussed on the music, it can help you put aside current troubles, which gives your sub-conscious mind the opportunity to look for solutions. This can have a very positive effect on your life. Learning to manage your emotions is key to achieving inner peace and happiness which in turn is necessary to function healthily in life. You can use music to help evoke positive emotions and deal with negative ones. I know as a naturally emotional person that it is difficult to function when you are in emotional turmoil and with such a natural trigger to help, music and emotion seem to be a perfect partnership to help deal with the challenges of life. Including being run over by a bull. Taxi.